Our Super Extra Large Virginia Peanuts blistered for that unique Diner crunch without the added salt for those who enjoy a heart-healthy snack. 10 oz. vacuum-packed tin. My wife and I were given a baby shower in my hometown in North Carolina. To show our appreciation, we sent peanuts to the hostesses. 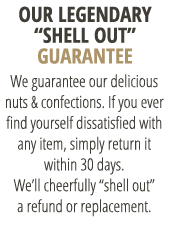 We choses peanuts since we live in Virginia and since Virginia peanuts are well known. We got much praise about the taste of the peanuts! Very good even though they are unsalted! 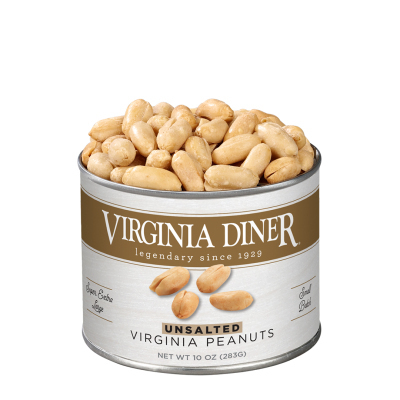 Virginia Diner nuts are the best! They are the perfect gift or appetizer here in Maine! Unsalted peanuts are a real big hit at work. I keep buying them and giving them away to people. They will ruin you for any other peanut, you will never want to eat any other brand again.